With HTML5, organisations will have the chance to reach out to a broader audience. Many mobile devices do not support Flash which means you are excluding a large part of your audience when using Flash-based resources. Also, some courses do not run on browsers such as IE or Firefox. This is because Flash requires a third-party browser plugin. HTML5, meanwhile, does not require any additional plugins to display eLearning content across various browsers. With HTML5-based eLearning, there is enough optimization of course content display irrespective of the device used. Learners do not have to worry about having to access some courses from their desktops or laptops just because heavy videos refuse to play on smartphones. They can access the content on their iPhone or tablet and HTML5 ensures that the output remains consistent. Modern learners are a busy lot and they want the flexibility of accessing learning resources anytime, anywhere and on any device. HTML5 makes such learning possible. Learners can take training even when they are on-the-go on their mobile devices. Moreover, HTML5-based eLearning courses are even known to consume less bandwidth as compared to Flash-based courses that can drain the battery life of mobile devices. Organisations can look at this switch as an opportunity to bring back focus on their content, remove unwanted content and revamp existing content. Think of the amount of losses you may incur if good online content resources are lying unused only because of lack of browser support for the Flash format. Flash to HTML5 conversion also guarantees a positive effect on the return on investment (ROI) from training because the existing content can be made mobile-learning compliant and can be enhanced using good design strategies. Employees often cannot take training course tethered to their workstations for several reasons. They may be on the move (sales, service, and technical staff), may be working in remote areas (oil rigs, areas where there is no internet connectivity) or maybe gig workers (work-from-home employees, freelancers, remotely working staff). These people prefer the option of offline learning where courses can be downloaded and can be accessed at a later time. Such a workforce also requires performance support tools (PSTs) from time to time. The switch from Flash to HTML5 is a good time to make content mobile learning complaint which can also serve as PSTs for learners to utilise anytime, anywhere at the point of need. HTML5-based eLearning is accessible on multiple devices which means learners have the flexibility to learn whenever they want to. The training does not have to be mandatorily taken at a particular time and place. Learners can access the training content whenever they are free, when they require and even when they are on-the-go. When eLearning courses are made available to learners in these situations, it helps to develop a learning culture within the organisation. 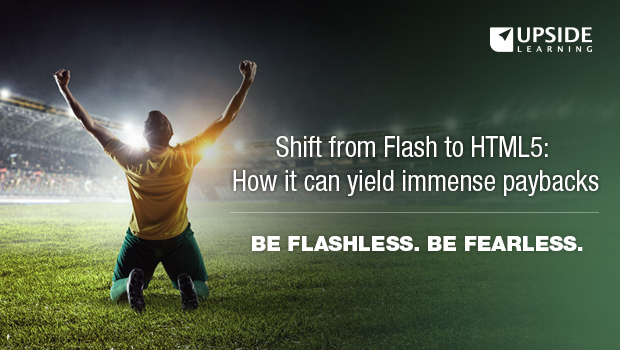 The conversion from Flash to HTML5 is a great opportunity to update content, reuse some of it and replace or recreate Flash-based courses. Authoring tools such as Articulate Storyline, Trivantis Lectora, and Adobe Captivate help the process and ease of updating the content. Learners will be able to make the most of eLearning courses without having to worry about plug-ins or player apps. In short, switching from Flash to HTML5 actually means future-proofing the eLearning content. Finally, whatever your content is like, you can rebuild it in HTML5, or convert it. The faster you decide to do it, the quicker you can avail of its benefits. If you are skeptical to do it on your own, you can always seek expert services for the conversion which will help you with a seamless migration.